Edelman discussed his agency's diversity targets at an HP Advertising Week event. NEW YORK: Edelman "still has a ways to go" with its representation of people of color in leadership, but is putting in the work to meet that goal, said the firm’s president and CEO Richard Edelman. Last year, HP launched a diversity initiative that asked its agency partners to increase female and minority representation on its account teams. 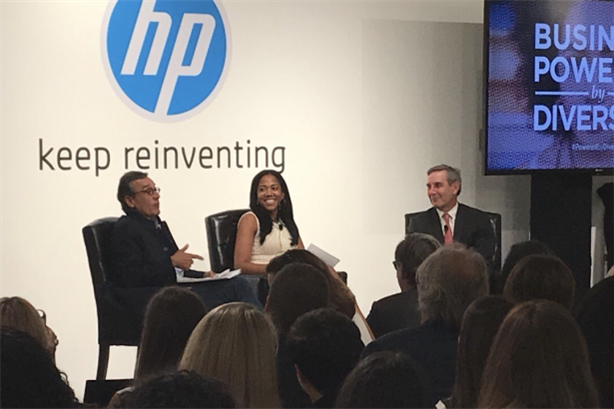 Edelman, interviewed by ColorComm president Lauren Wesley Wilson at an HP event on diversity Monday, discussed what his firm, an HP agency, is doing to meet those goals. Each of HP’s advertising and PR agencies exceeded the goal for representation of women, but three fell short on minority representation in leadership, the company said Monday. Edelman was 4% below its target. "We’re pretty good at the entry level stuff," Edelman said. "We have a huge effort to go to Howard University and other primarily black colleges to recruit, to go to conferences like [ColorComm] to try to find people, but we lose people when they get to the VP level. We now understand we have to recruit people in the mid-levels. If you don’t have that 35-year-old, you have to go get them." Edelman’s mentoring program for young employees has been successful. The firm also places people of color not just on accounts aimed at diverse audiences, but on all accounts, Edelman said. He also announced his support for a platform where people of color can showcase their work, saying it would make it easier to find them. CEOs from HP’s other agencies, BBDO Worldwide, Fred & Farid, Gyro, and PHD, also spoke at the event about their diversity targets. BBDO and Gyro also both fell short of their minority representation targets: BBDO by 8% and Gyro by 24%. "We’re in a time of Charlottesville and Ferguson, how can we not have people of color expressing that which is going to sell products for our clients?" Edelman said. "If we fail at this, we fail in society. We are actually able to drive what happens in society based on the ideas we come up with and it changes how people think of things. We need to get people of color to come forward in strength."